There's an idea out there that can be defeating to people getting into art journaling: an artist has the idea mapped out completely before starting. Oh, I'm sure some artist can do that, but there is another philosophy. This philosophy is that letting art happen organically, naturally without tight control . This practice can lead to amazing results. For a someone like me that never found the perfectionist within, it's joy. It's like play and experimenting rolled into one. Here's a video showing you every little thing I did. Often I like to choose a technique to start with. For this page I chose blowing pigment with a straw. This technique works well with watercolors, water soluble crayons--actually with any water soluble medium. I scribbled on the bottom of my spread with Scribble Sticks, wet it with a water brush, and then blew with the straw. Since I chose not to gesso, I did use a lot of water. I used three cool colors and allowed them to mix and mingle at the bottom where they all connected. This technique is like dripping where you add your medium at the top, spray it with water and tilt your page. I wanted to add some texture so I tore some gelli prints up and added those with matte medium. It started to look like a plant, so I decided to add a bee stamp. Stamping on a started page can be scary. I've done that before and made a mess. I solved that little dilemma and you can click here to find out how to fix mistakes on your page. Instead of stamping on my page I stamped on plain old white tissue paper. 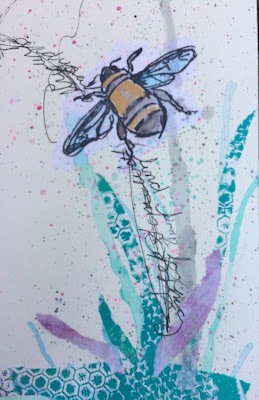 Using a water brush I went around the bee without letting the water touch the stamped image. Then I gently tore the image out. 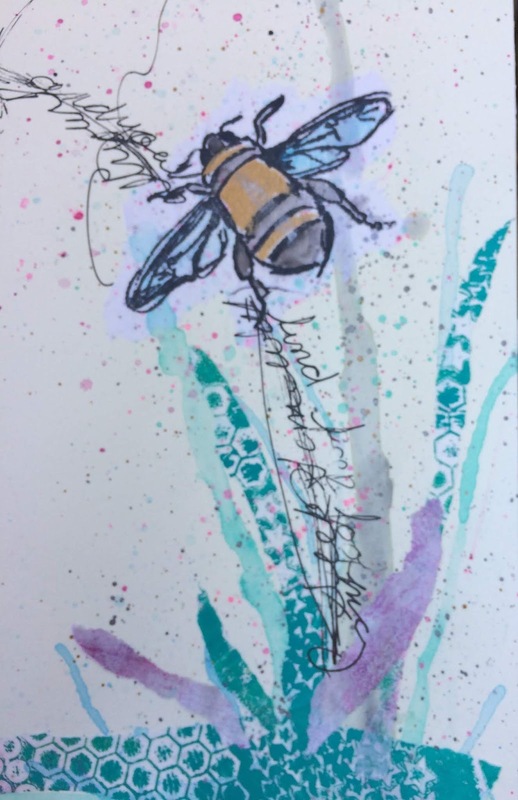 I put matte medium on my page where I wanted the bee and then placed the bee on that spot and smoothed it out. Don't put matte medium directly on the tissue--it will fall apart. I know all about that! 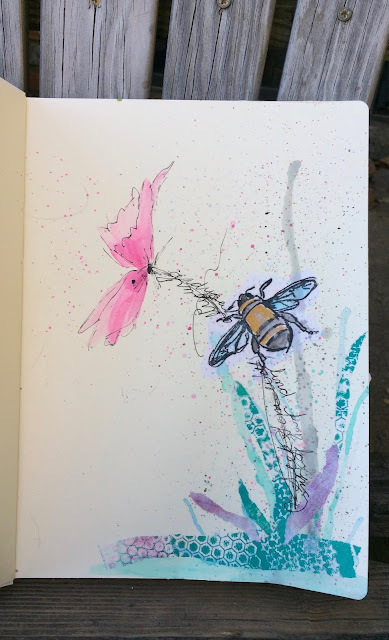 Now that the bee was added the page was begging for a flower. I looked at flower images on Pinterest. ( I created a flower inspiration board to use when I need a flower. ) With a few strokes of the Scribble Sticks I made the general shape of the flower an then sketchily went around it with a dip pen and India ink. Then I journaled along the stem. Of course splatters make all the difference so I added them along the way. I hope you try this technique and play. Want to peek at my Etsy Store? Click here. I've chosen not to make a big supply list at the bottom of my posts because I'm sure what you have will work fine. If you have any questions about a product I've used I'd be happy to help you with that. The music on my videos is played by the talented Kevin McCormick. You can find more music by him here.